IMPACTS are the number of individual opportunities we offer our audience to view your advertising campaign across all of our platforms. It’s beautifully simple. We combine the number of impressions on digital and social, then add in print impacts (the number of your ads multiplied by our readership figures), to provide you with a single, reliable figure – the total number of impacts that you will receive. IMPACTS bring the online and offline journey together, seamlessly combining your campaign planning and analysis across our print and digital portfolio. We tell you how many times your campaign will be seen, collectively, across all media. By using this approach, regardless of who you speak to, customer or colleague, there is consistency every time you discuss your campaign. IMPACTS allow you to easily compare the success of your campaign with us to other advertising channels such as outdoor, television and radio advertising. As we provide you with a single figure rather than multiple metrics, you can more easily measure your return on investment, channel efficiency and cost per thousand compared to other media. IMPACTS make us accountable. We are no longer selling you an advertising campaign based purely on the size of our audience (as impressive as it is!). Instead we’ll tell you the amount of IMPACTS we will deliver for you based on your spend. You will know exactly what you will be getting from the moment the campaign is pitched. 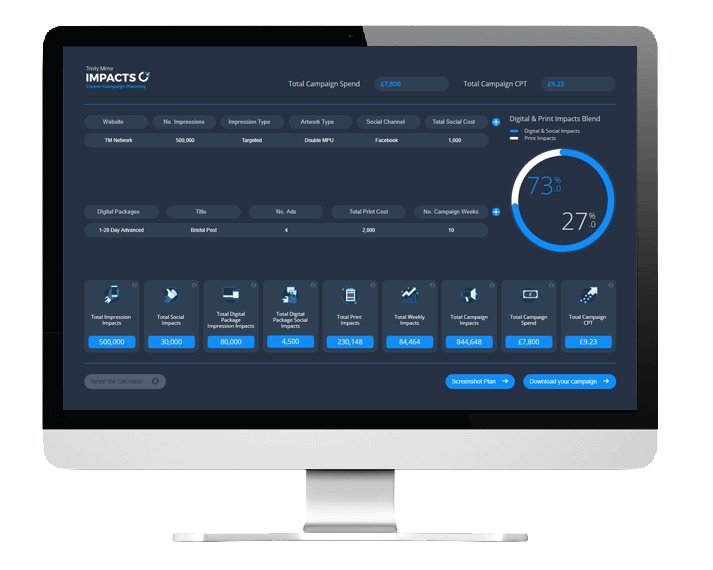 IMPACTS provide you with an actual quantifiable figure, making it much easier for you to track ROI – particularly across multiple campaigns. We are committed to the IMPACTS approach and believe it will make a real difference as we work with you on future campaigns. To simplify the IMPACTS approach further, we have developed an online calculator that we use to build your campaign. We will sit down with you and enter your requirements and the calculator will instantly display the digital and print mix of revenue and IMPACTS. The results can then be tweaked on the fly until the perfect mix is reached. To learn more about how IMPACTS can transform your campaigns, and to see our online calculator in action, talk to one of our commercial people today.